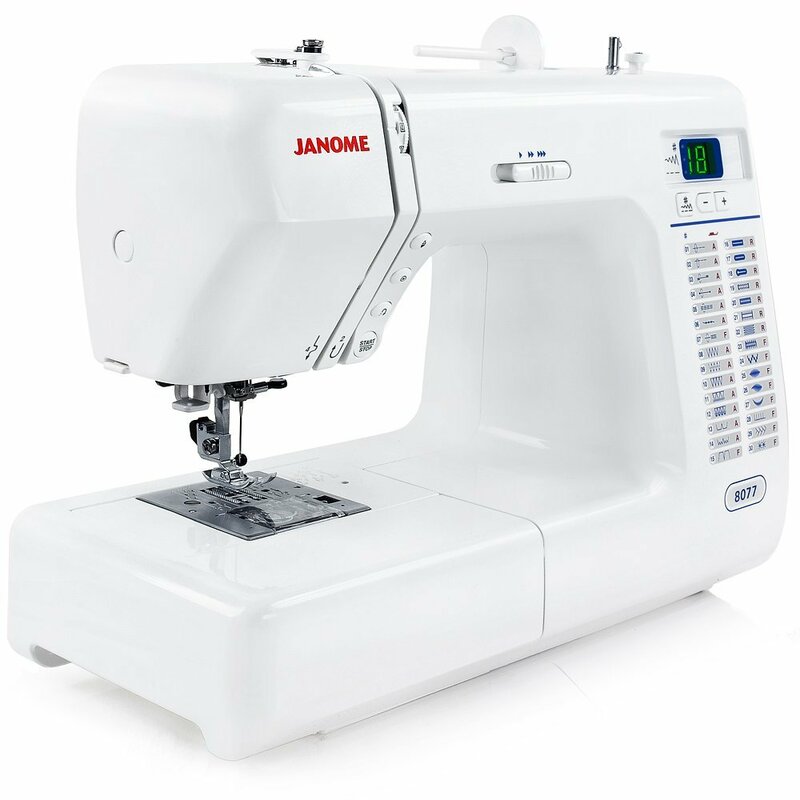 The Janome 8077 computerized sewing machine is a perfect tool for beginners. With 30 built in stitches it can make your sewing experience both easy & an absolute joy. It’s not just a great sewing machine in terms of its features & other things, but it is also a great machine in terms of its looks. It’s simply a masterpiece when it comes to looks. If you are looking to gift your mother or other dear ones something good then 8077 can easily fit into it. Apart from its stunning looks the 8077 offers a whole range of capabilities that is unmatched by its competitors. As has already been said the machine comes with 30 built in stitches e.g. overlock, domino, straight stretch, durable stretch, shell tuck, elliptical, sphere, crescent & many more. It also comes with a great selection of buttonhole styles. The 8077 come with four included snap on presser feet. They are General Purpose Foot, Zipper Foot, Satin Stitch Foot and Automatic Buttonhole Foot. The presser foot pressure is adjusted automatically. It is designed to handle all types of fabrics from light to extremely heavy ones. Threading the 8077 is also very easy. It comes with an automatic bobbin winder which stops when bobbin winding is complete. The needle threader is also automatic. That way it does not put much pressure on your eyes. The Janome 8077 comes with push button control. Just with the touch of a button you can choose the function you want the machine to perform during sewing. Start-Stop button enables you to sew without a foot control. It has a speed control slider which lets you control the speed of your sewing. Bright two digit LED screen offers simple stitch selection. Compared to its contemporaries this machine has a much superior feed dog mechanism. The bobbin cover is transparent so that you can see how much thread you have left in the bobbin. It also has a built in carry handle which allows you to carry it wherever you want. Also at 16 pound this is machine is not very heavy. The machine is quiet. It runs smoothly & sews high quality stitches. Plus it is light weight which makes it easy to carry. Automatic bobbin winding mechanism, automatic needle threading makes it really easy to operate even for first timers. The machine performs equally well over light & extremely thick fabric, leather with no adjustments whatsoever. With stunning looks it also makes for a good item to have in your home. It is a good investment if you have a lot of sewing tasks to perform. It will perform those tasks quickly & efficiently. You will also not get tired even if you are using it for larger sewing projects. The machine performs flawlessly irrespective of the nature of tasks it is given. We have not come across much bad reviews about the Janome 8077. So from us The Janome 8077 is a highly recommended investment for you.